When you take a look at miniatures games, it seems like most of them focus on facing aliens or some other faction on a map battling it out for superiority. Few games focus on the inner workings of the crew and working together. Battlestations does both, but it’s been difficult to find a copy. However, the second edition is now available on Kickstarter. 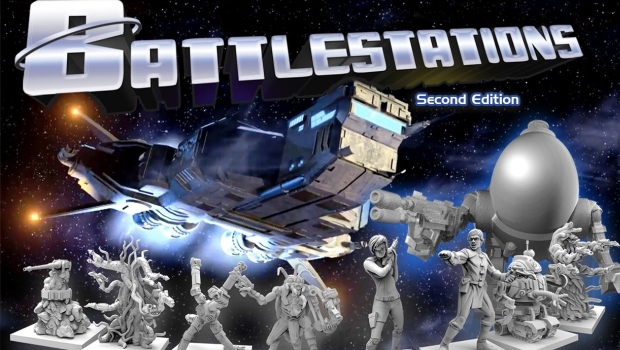 Billed as the “Tabletop Starship Simulator,” Battlestations is the long-awaited second edition of the classic board game/RPG hybrid where players collaborate to accomplish a variety of missions like fighting space pirates, smuggling, and piloting through asteroid fields. Designer Jeff Siadek (Lifeboat, Desert Island) and Producer Joey Vigour (Chaosmos) have worked for over a year on the project, and the Battlestations universe and mechanics have been growing since the year 2000. Sixteen years and 10 supplement books later, the new edition has finally debuted on Kickstarter with miniatures and all-new art. It fully funded in just over a day and the team has promised great stretch goals like guest missions by Richard Garfield and other famous designers. I’m surprised that this is coming back, but very happy it is. The new version looks great with some impressive figures. It has reached several stretch goals, so backing it is a no-risk proposition. If you like multi-layered gaming, then be sure to check this out. Don’t delay though, as there isn’t much time remaining.